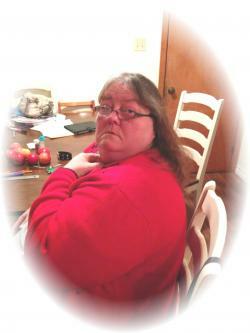 The death of Lucy Louise Hawkes of Florenceville-Bristol and formerly of Pole Hill occurred on Thursday, February 7, 2019 at the Upper River Valley Hospital, Waterville. Born January 25, 1969 in Woodstock she was the daughter of the late Vincent and Jeanette (Hamilton) Etherington. She was also predeceased by 1 brother, Jackie; 1 sister, Margaret Rose; 1 niece, Bobbie Jeanette and 1 nephew, Vincent. Lucy is survived by her loving husband, James; 11 siblings, Christine Hamilton, Doreen Mercier, Willy Etherington (Karen), Josephine Ginson (Stanley), Edward Etherington (Linda), Joseph Etherington, Elizabeth Campbell, Arden Etherington, Tony Etherington (Christine), Martin Etherington and Alberta Etherington (Les); chosen children, Tj Holmes (Maddie), Jorey Holmes (Zachery), Arthur Rideout, Reggie Clark, Heidi Clark (Matthew) as well as several nieces, nephews and extended family.